You cannot apply for this visa directly. You must first be invited to do so through SkillSelect!Click here to find out what this means. 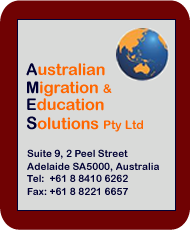 When your nominated occupation is on the current SOL, and you score at least 60 points on the Points Test, you may be able to gain permanent residence in Australia by being sponsored either by a State or TerritoryMost State Migration Plans include occupations that are not listed in the current SOL. AMES will be able to advise you whether or not you meet the sponsorship criteria and if you do, how to obtain State/Territory sponsorship., or by a family member resident in Australia. If you obtain sponsorship from a State or Territory, you can count an extra 5 points towards your Points Test score. Sponsorship by a family member does not earn you extra points for this visa (though it does do so in the case of the Skilled Regional Sponsored Visa). The full requirements for the Skilled Nominated Visa are that you must be under 50 years of age and have adequate EnglishYou must prove this by providing the International English Language Testing System (IELTS) score required for your nominated occupation.. You will also need to have formal professional qualifications in your nominated occupation.Your nominated occupation is the occupation for which you have a Skills Assessment. Whether you are, or are not, a professional in your nominated occupation is determined by the assessing body designated by Australia The Skilled Occupations List published by DIAC shows which assessing body you need to approach for your particular occupation. to assess your skills and qualifications. For the former you have to actually sit for the IELTS Test - DIAC does not accept any other test of English at this time - and you should do so well before you start planning your visa application. The timing and the results of the IELTS test are entirely within your control. The Skills Assessment, on the other hand, does create some uncertainty: it is usually the first stage of the visa aplication process and as such the outcome cannot be predicted. In the vast majority of cases, however, if you have scored 60 points on the Points Test and as long as your application follows the rules and the supporting documentation is perfect, it is unlikely that your skills assessment will be negative. In the unlikely event that this should happen, most Assessment Authorities allow an application to be submitted more than once. Are you familiar with the IELTS Test? If not, click here to find out all about the IELTS. Do you know what Skills Assessment involves? If not, click here to find out all about Skills Assessment. Do you know what the Points Test involves? If not, click here to find out how points are allocated in the Points Test.